PALM SPRINGS, Calif., April 1, 2019 /PRNewswire/ — MSACL US 2019 — Laboratories can deliver the rapid quantitation of time-critical samples in a single run with the launch of an easy-to-use, direct sampling source that is designed to decrease reliance on a complex chromatographic separation step for a wide range of routine mass spectrometry-based applications, including drug analyte testing and drugs of abuse analysis. The Thermo Scientific VeriSpray PaperSpray ion source is a high-throughput direct sampling system that is expected to reduce the need for separation by chromatography before mass spectrometry (MS) analysis in routine workflows, simplifying sample preparation, potentially reducing the cost-per-sample and overcoming sample backlogs. The system’s interface is simple to operate, regardless of the analyst’s level of experience. 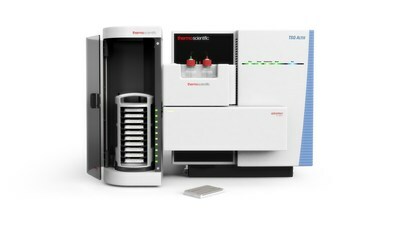 Thermo Fisher Scientific is showcasing its new direct sampling system during the 11th Annual North American Conference of The Association for Mass Spectrometry: Applications to the Clinical Laboratory (MSACL US 2019), being held March 31–April 4, at Booth #4-6 at the Renaissance Hotel and Convention Center, Palm Springs, California. The VeriSpray PaperSpray ion source is compatible with the following Thermo Scientific mass spectrometers range for enabling the sensitive and selective analysis and quantification of compounds in complex sample matrices: Thermo Scientific TSQ Quantis Triple Quadrupole Mass Spectrometer, Thermo Scientific TSQ Fortis Triple Quadrupole Mass Spectrometer, Thermo Scientific TSQ Altis Triple Quadrupole Mass Spectrometer, Thermo Scientific TSQ Endura Triple Quadrupole Mass Spectrometer and Thermo Scientific Quantiva TSQ Triple Quadrupole Mass Spectrometer. For more information on the Thermo Scientific VeriSpray PaperSpray ion source, please visit www.thermofisher.com/verispray.